My earliest movie related memory is my dad coming home from work and handing me a pack of trading cards. 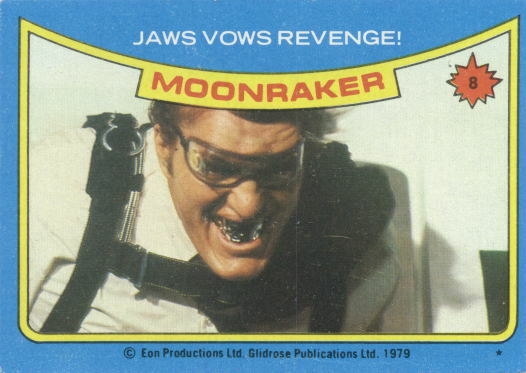 They say ‘Moonraker’ on them and feature some guy named James Bond 007. He says we’re going to the drive-in to see it that night. The cards feature a man in a silver space suit and a sticker of some woman, but more importantly it has a space shuttle, and a huge guy with metal teeth. I don’t remember much of the actual time at the drive-in, at least until the lasers started flying at the film’s climax. That’s when it comes alive. I push myself up onto the dashboard; I want to crawl into the film. My eyes are wide and I can't stop smiling, the whole experience is electrifying. We have music from ‘Close Encounters of the Third Kind’ on 45, LP and 8-track. We listen to it all the time, especially when we're driving around downtown. My dad tells me if the aliens ever come to visit him, he’d love to go on a ride in their spaceship. He’d love to see what’s out there. He says if he did it, he’d be gone for thousands of years. The idea is awe inspiring. It sounds amazing, but I don’t like the idea of him being gone so long. A year later, I’m in full Godzilla obsession thanks to a late night showing of, ‘Godzilla vs. 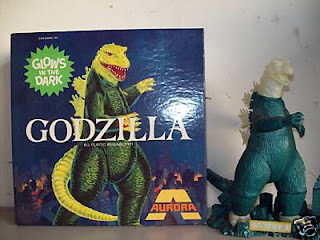 The Cosmic Monster’ and a handsome Aurora Godzilla model kit with glow-in-the-dark parts that sits on my dresser. On the TV is an ad for ‘Godzilla vs. Megalon’ and it looks like the coolest thing to ever exist. I beg my parents to let me see it. On a sunny Saturday afternoon, my dad and I head to a tiny theater. After playing some Rally-X, we head inside. To my five year old eyes, the movie is utterly amazing: giant monsters wrecking each other with atomic breath and death-rays, a robot that can change size, Godzilla brought to the edge of defeat only to rally with the help of his new friend and send Megalon and Gigan packing. Even more importantly the small audience is into it, cheering on Godzilla, whooping and laughing when he slides on his tail to into Megalon. My dad joins in and so do I. 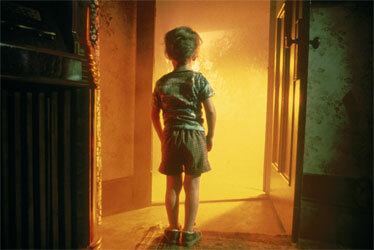 A lifelong genre movie fan is born at that moment. He dozes through 'Tron.' Takes me to see 'Return of the Jedi' more times than I can count. Puts up with my obsession with 'Gremlins,' 'Critters', 'Ghoulies', and all things small and monstrous. He is appalled and amused at the violence in 'Robocop.' Cheers along with the audience during the monster's revenge in 'The Fly II'. Thanks Dad, for introducing me to monsters, aliens, and spaceships. Thanks for nurturing and allowing that interest to spread into art and writing. You'll be missed but remembered every time I see Godzilla stomp a building or a glowing saucer pass through the night sky.